Microsoft's possibly forthcoming own phones have been shown off in renders, giving a lot more weight to rumours the software giant is about to bring out its own hardware. The new phones, codenamed Pure and Turtle, have been shown off by Gizmodo, which also brought us news of the forthcoming Courier yesterday. 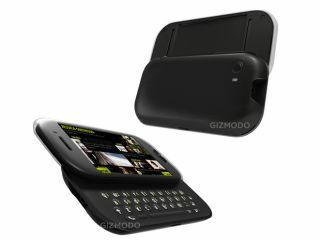 The Turtle looks like it takes a lot of cues from the Palm Pre, with a bean-like shape and the full QWERTY keyboard. The Pure is a more conventional device, with a full QWERTY keyboard underneath a large sliding screen and rounded buttons. It's anticipated both will have a lot of the Zune services Project Pink has allegedly been working on deep in the heart of Microsoft, so although the Zune phone has been denied, this is as close as we're likely to get for now. The form factor is likely to please the US market more than the UK, with a Sidekick style form factor a lot to do with Microsoft's acquisition of Danger, the social networking and media platform it bought last year, which developed the hardware for that range. And it looks like that relationship is set to continue, with Gizmodo stating Sharp will stay on board to manufacture these phones, which many have dual Microsoft and Sharp branding. Word is that these might run some kind of overlay on top of Windows Mobile 7, which is due out next year, although it's probably going to be a few months before we get any more concrete information.